Tool for proxying TCP connections through open socks servers. Is there a better alternative to iBounceIT? Is iBounceIT really the best app in Internet Utilities category? Will iBounceIT work good on macOS 10.13.4? iBounceIT is a tool for proxying tcp connections through open socks servers. You can start as many bouncers as you need, each one listening on a different local port. Supported clients include ssh, telnet, rsh, rlogin, rcp, irssi. 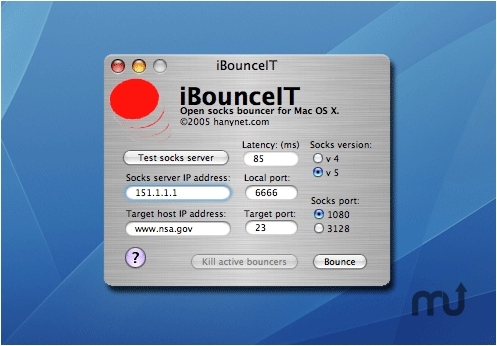 iBounceIT 1.5 runs on Mac OS X 10.5. iBounceIT 1.4 runs on Mac OS X 10.3 and 10.4. iBounceIT is distributed as Universal Binary so you can run it on both PowerPC and Intel platforms. BounceIT is freeware and opensource. Thanks to the coder of sbouncer.c. iBounceIT needs a review. Be the first to review this app and get the discussion started! iBounceIT needs a rating. Be the first to rate this app and get the discussion started!